Kindle Array the answer to the large scale e-ink display? I have been asking the question over and over in different circles, is there such a thing as a large scale eink display? It seems the answer is no but I’m more interested why not? Then yesterday while at lunch with a couple of colleagues in BBC R&D, Robert was asking me questions about my Kindle because he was considering buying one for his girlfriend and I was running through the advantages and disadvantages. Somewhere in the conversation, Andy mentioned my question about a large scale eink display (the advantage of being public again). I explained why I think it would be good and somewhere along the conversation one of us 3 suggested (think it was Andy) taking a Kindle apart and stitching them together. I had quick thought, you could make an array of kindles and then control them to display what you want. My next thought was if you could tile post to the Kindles/eink display. And that was it! An array of eink displays fed the right part of the whole document. The advantage of a Amazon Kindle over a standard eink display is the wifi radio and email address, which means you can send each one a document remotely via something like rasterbator and if you can control them, you can remotely make them display a document as a screensaver. Later in the lab while eating cake (we seem to eat cake quite a bit on Fridays) I thought maybe this could be done via Arduino using the USB shield. Practically you would only need to root each Kindle using this method. Then by uploading a slightly different image to each one, you could create a tiled display or as I’m calling it a digital array. Ultimately you want some software running on a Kindle which you upload the document/image to, it interrogatives its neighbours to work out how big the array its in is and only displays the part which makes sense. Because the Kindle is running gnu/linux, it would be possible but to be fair I’m not even going there, but if someone else wants to be my guest. I’ll be hacking around with this concept in the near future, and welcome any thoughts or ideas on this idea. Currently I’m just double checking if there is a large format eink display and trying to work out what is the best eink display to start with? The Wifi Kindle makes sense because its cheap enough, software hackable and easily hardware hackable. Although the Kindle DX does also look pretty good. I’m hoping for the Kindle Fire sale to start pretty soon, maybe. Of course I’ve been doing my research and it seems NEC created a A3 size eink display a while ago, it also seems I wasn’t the only one thing about turning them into tiles. 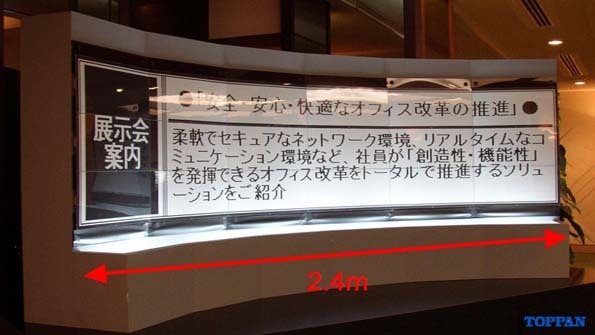 2.4 meters certainly counts as a large eink display… So the question is how do we get our hands one and how much do they cost? Next Next post: What happened to Dj Hackday?